William Gurstelle’s Defending Your Castle: Build Catapults, Crossbows, Moats, Bulletproof Shields, and More Defensive Devices to Fend Off the Invading Hordes ($15 from Indigo) asks what we’ve all been thinking: could you defend your modern home against the likes of Attila and the Huns, Ragnar and the Vikings, or Genghis Khan and the Mongols? The answer: probably not. But Gurstelle is here to help, with instructions to help every garage mechanic and backyard warrior build catapults, walls, ramparts, and all sorts of other things that’ll get you in trouble with your better half. Today: how to build a moat. Excerpted with permission of the author. From Neolithic times onward, home defenders have shaped and mounded the landscape around their homes to make them more secure. Even in the earliest societies—the Druids in England, the mound builders of pre-Columbian America, and the Mesopotamians who lived in Jericho, for example—people have built earthworks for protection. There are many examples of early defensive earthworks. Silsbury Hill, a 130-foot-high mound on a plain near Stonehenge, was built by ancient Britons around 5,000 years ago and is assumed by many to have been built to support both warlike and religious affairs. Similarly, ditches have a very long history. In Austria, archaeologists recently uncovered a Neolithic settlement covering a full 50 acres. This place, a few miles north of modern Vienna, is known today as Grossrusbach-Weinsteig. The early human settlement was protected by a 12-foot-wide defensive ditch. Radiocarbon dating estimates that the ditch was constructed around 4500 bce. The most effective protection method in past times was the water-filled trench, or moat. Even today, despite the great strides made in home security and self-defense technologies, moats still provide a level of protection unrivaled by any other defensive earthworks. While building a moat around your castle is neither inexpensive nor simple, that plain fact is that, once built, a moat assures a level of protection against invaders and interlopers like nothing else. The12th through 15th centuries were the salad days of moat building. 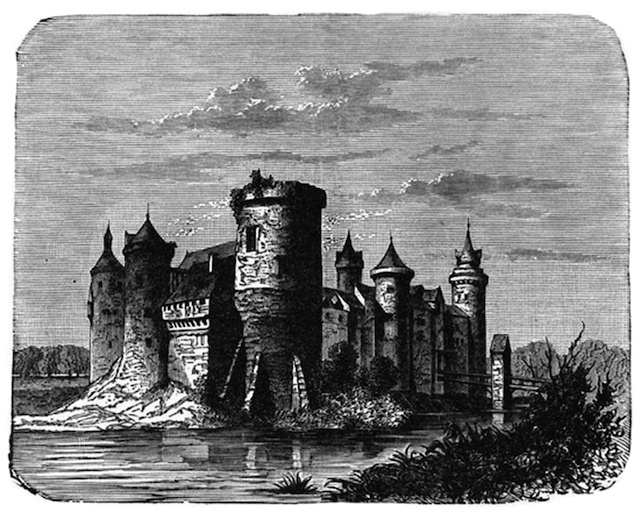 Hundreds of moats were installed in England, continental Europe, and the Far East. Few moated buildings were actually attacked and fewer were taken, attesting to the psychological and physical advantages a moat provides. Consider the siege of Rhodes castle in 1480. An Ottoman army attacked a garrison of about 3,500 Knights Hospitaller inside the fortress. Although it is written that more than 70,000 Ottoman soldiers besieged the castle, the design of the fort, with its thick walls, colossal towers, and above all, its gigantic dry moat, was impervious to repeated attack. Today of course, moat construction is no longer common or easy. A large, well-built moat could cost $50 or more per square foot, although costs vary widely depending on factors such as the amount of excavation required, the soil conditions, and the availability of water. You’ll need a dependable water source to fill and maintain the moat. A 12-foot-wide moat, 200 yards long and 6 feet deep, will require an initial fill of nearly 500,000 gallons. Although soil composition varies from site to site, most moats should be lined with layers of clay to stop water seepage. Diverting natural sources of water such as streams and springs is the most economical method of obtaining water, but be sure to consider the attendant legal and environmental issues prior to building the moat. If possible, connect your moat to a source of running water such as a stream via movable sluice gates. Flowing water will reduce the problems (e.g., odor, insects, and pond scum) associated with stagnation. If no natural source of water is available, wells and municipal water systems are alternatives but can be very expensive. Talk with an attorney experienced in water rights before investing in any moat or moat-related equipment. Consider your climate. In cold weather areas, the moat could freeze over in winter, providing easy access to your property for people or even vehicles, negating the moat’s most important security features. Contact your local zoning commission before beginning construction. In many cases, a variance or special permission of your neighbors may be required. A building permit is likely required. Few modern building contractors have experience building moats. Carefully interview prospective contractors and make sure they have completed projects that have included large water-holding structures in the past. It’s generally best not to have builders learn new techniques on your dime. Moats are high-maintenance items. 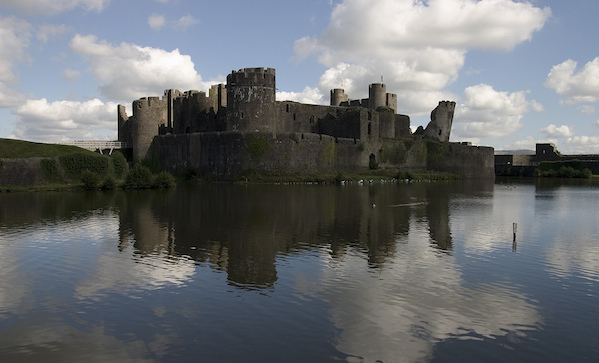 In hot months, stagnant water can lead to high insect populations, deteriorating masonry, offensive odors, and unsightly trash buildup unless the moat owner commits to a regular program of moat maintenance. As evidenced at the fortress of Rhodes and Nagoya Castle in Japan, it is possible to forgo water and build what is termed a “dry moat.” However, the physical and psychological protections afforded by a water-filled barrier make wet moats more effective. If possible, consider locating your home on a small, isolated island instead. Doing so, a home owner can accrue all of the security advantages of moat ownership without the high initial outlay and ongoing maintenance costs. 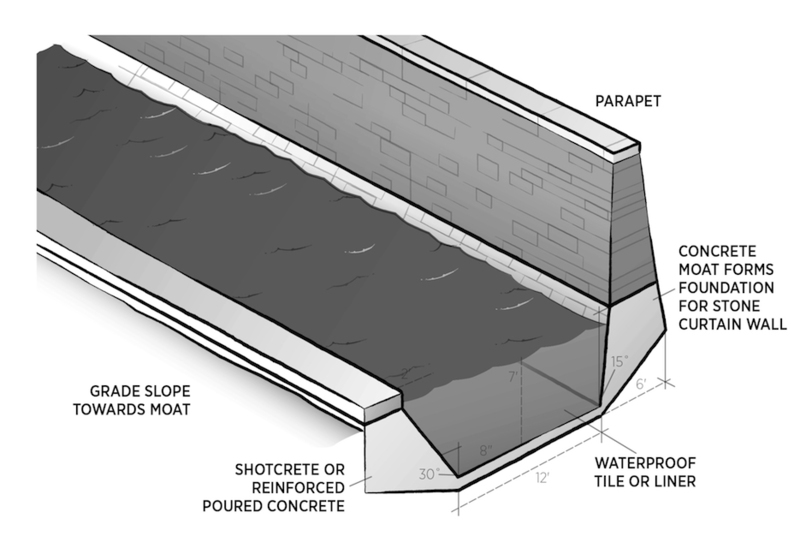 These drawings will provide a starting point for building a moat around your home. 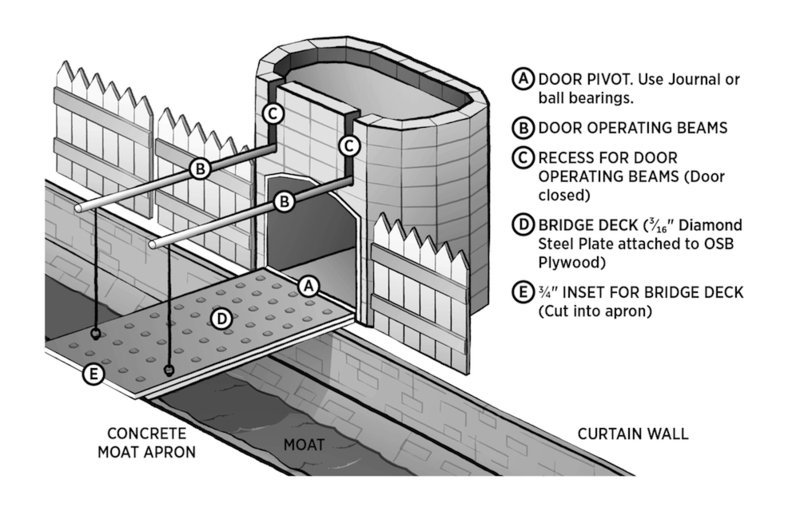 Moats are most effective when paired with a high masonry or stone wall, called a curtain wall, just inside the moat. The curtain wall should be at least 8 feet high and 4 feet thick at the top and extend, save for the gatehouses, continually in an unbroken line around your property. 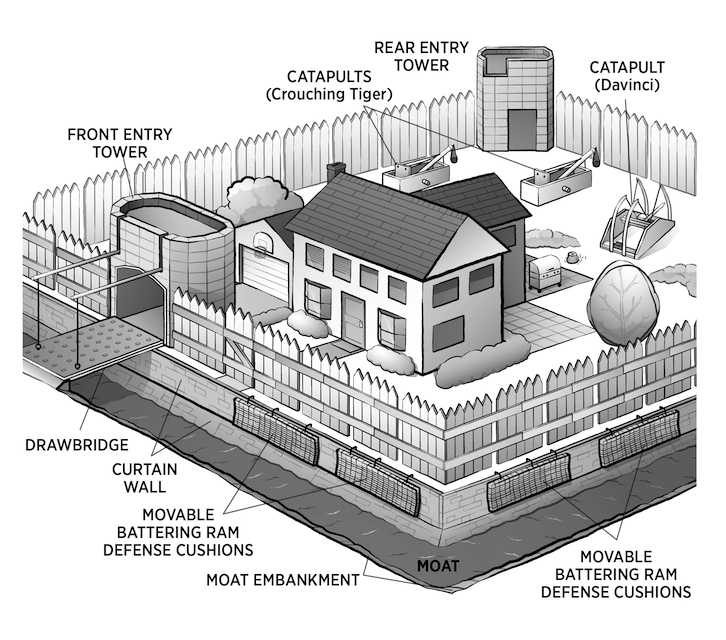 These dimensions will provide adequate space for a maneuvering area, known as a rampart, atop the wall for defensive action should the situation arise. The ramparts should be protected by battlements, which are walls with regular openings used to provide cover while allowing offensive fire. Curtain walls may be made from any locally available stone provided the stone is free from pits, fissures, and other water entry points. Granite, limestone, and flint work particularly well. At least two entry points or gates through the curtain wall are required. One is the main entrance and the other is for emergency egress should the main entrance become unusable. Gate planning is especially important when planning a moated home space. Place access stairways to battlements and ramparts at frequent intervals. Stairways should be made large and wide enough to allow material and ammunition to be carried conveniently to the battlements. When constructing the moat walls, there are many options to consider. It is important that the contractor use iron rebar inside the concrete as reinforcement as the pressure applied by the water to the sides and bottom of the moat is substantial. Vintage castles often used several layers of clay hand-applied over the excavation area. However, modern construction methods are definitely superior. “Shotcrete” or “gunite” construction is the most cost-effective method of lining a moat. Both of these terms refer to the same concept—a pneumatic method of concrete application that uses high-pressure air to spray a mix of marble dust, mortar, and water through a hose onto the surface of the moat. A moat construction crew digs a hole, installs the plumbing necessary to fill it with water, and then assembles a framework grid of 3/8-inch steel reinforcing rods (rebar) covering the bed of the moat. The rebar are laid out on 10-inch centers and fixed in place with wire. The crew sprays a heavy coating of shotcrete mix around the rebar. The crew trowels the shotcrete and lets it cure for a week. Then the crew returns to apply a second finish coating. If desired, stones or pebbles can be embedded in the shotcrete to give it a better-looking finish. A moat built in this fashion will be long lasting and impervious to most mining or escalade attacks. Alternatively, a moat may be constructed from poured concrete, but this type is generally more expensive to build. Instead of spraying concrete material around a rebar framework, concrete is poured into wooden forms and allowed to cure. Egress and ingress to the home through the moat and curtain walls is made through specially designed gates and bridges. There are many important considerations when designing curtain wall fenestration, including the drawbridge design, bridge operators, and gate house construction techniques. Diagram 6.4 illustrates one type of drawbridge. It is important that the drawbridge be designed such that it can be operated manually (e.g., via a hand winch or block and tackle) should electricity become unavailable. Be certain to discuss these items carefully with your moat builder prior to groundbreaking. Photo courtesy of Dmitry Shakin.